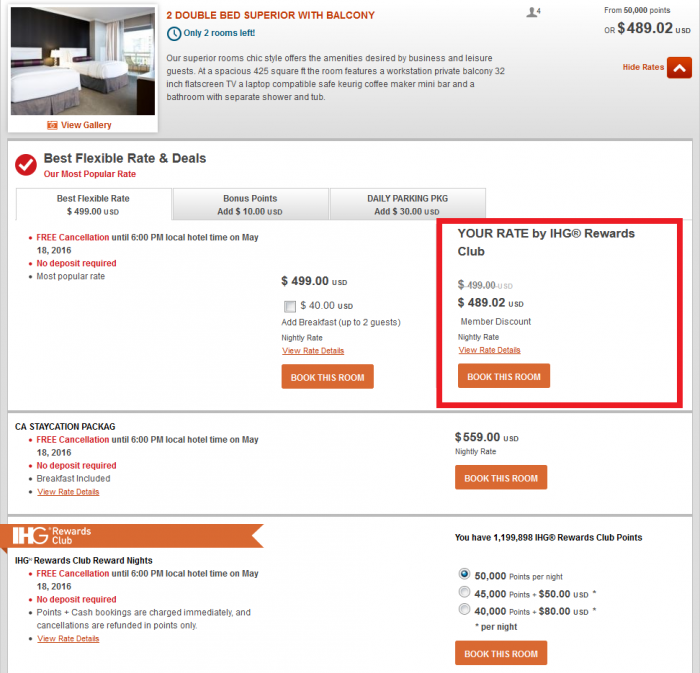 IHG Rewards Club has today launched “Your Rate by IHG Rewards Club” for stays in North America. Europe should soon follow and rest of the regions (Middle East, Asia, China and Africa) later in the year. Seems that this rate in the cases that I checked and documented below is 2% to 4% off of the publicly available rates including sometimes Advance Purchase ones. You can access IHG’s web page for Your Rate here. The discount here is 2% off of the Best Flexible Rate. Montreal property is discounting both the Advance Purchase and Best Flexible rates by 4%. Miami only discounts the Best Flexible Rate by 2% while there is lower Advance Purchase one available. IHG (InterContinental Hotels Group), one of the world’s leading hotel companies, today announces the global roll out of Your Rate by IHG® Rewards Club, an exclusive rate offered to IHG Rewards Club members when they book direct. It is part of the on-going evolution of IHG Rewards Club, the world’s first and largest hotel loyalty programme, with over 92 million members worldwide. IHG Rewards Club already offers industry leading benefits that include no blackout dates on Reward Nights, mobile check-in and extended check-out times. From this month, Your Rate by IHG® Rewards Club will launch at IHG hotels in the Americas and Europe, and will be promoted as part of major brand campaigns in both regions. It will be rolled out across the remainder of IHG’s estate in Asia, the Middle East, Africa and China later in the year. The new member benefit will be tailored to reflect the local dynamic in individual regions and markets. IHG’s decision to launch Your Rate by IHG® Rewards Club follows a successful pilot of exclusive member rates in Europe and the Americas in 2015. It is supported by extensive consumer research into what IHG Rewards Club members are looking for from a loyalty programme, namely that they belong to a special club with preferred pricing for members. All the hotel chains have now begun to offer member exclusive rates and IHG Rewards Club has offered them with some sales previously as well. 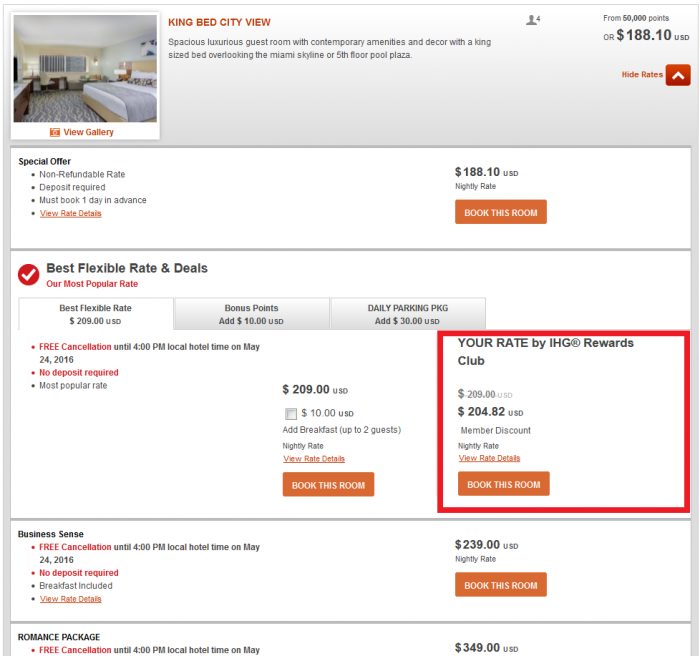 The discount with these “Your Rate by IHG Rewards Club” appears to be 2% to 4%. It is inline what discounts othe chains are offering. The reason behind these “member” only rates are that most of the hotels have rate parity agreement with OTA’s such as Expedia, Priceline and Booking.com. They are not allowed to advertise prices lower than the “standard” ones. The way around this for all participants is to offer member only rates that merely require you to sign up for their loyalty program in case of hotel programs or OTA ones.